ORANJESTAD - According to the Aruban news site NoticiaCla, ConocoPhillips successfully seized two supposedly PDVSA oil shipments in Aruba Monday night. This was confirmed by the Minister of Energy Evelyn Wever. This comes one day after Wever told the Aruba press that Aruba got lucky, as the initial seizure intent by ConocoPhillips over the weekend was unsuccessful. She however also claimed that ConocoPhillips and others would continue trying and that with those we might not be as lucky then. 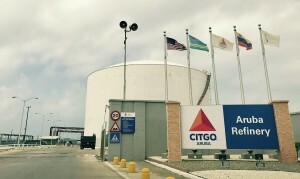 CITGO Aruba meanwhile, is contesting the seizure in an Arubano court this morning, claiming the oil is not PDVSA but CITGO property.